Antiy – an important enterprise node of China's network security emergency response system – has been rated highest for its excellent performance in CNCERT and its sub-centers. 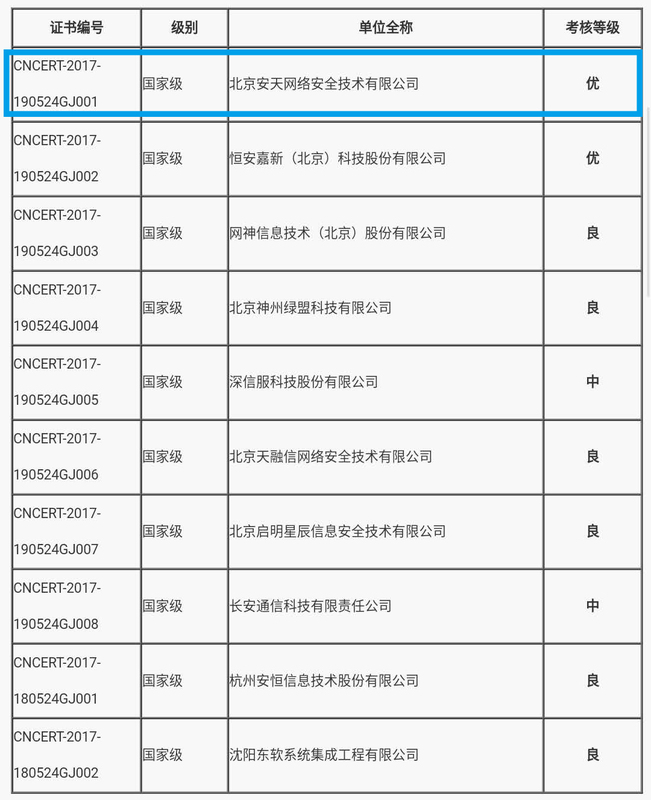 Recently, the National Computer Network Emergency Response Technical Team/Coordination Center of China (CNCERT) carried out the 7th assessment for organizations providing network security emergency response support, mainly concerning the supporting work from June 1, 2017 to April 30, 2018. Antiy was one of the two state-level supporting units rated excellent, while a dozen of others were rated good or medium. 'CNCERT Network Security Emergency Service Supporting Unit’ aims to select excellent public Internet emergency service units to cooperate with CNCERT to carry out public Internet network security emergency service work. The emergency service supporting units are selected every two years, judging candidates against several criterions enterprise capacity, emergency technical capability and service standard, as so on..
Antiy has been awarded the ’National Network Security Emergency Services Support Unit’ since 2009. As an important enterprise node in China's network security emergency response system, Antiy is mainly responsible for in-depth APT analysis, malware monitoring information sharing and analysis, security vulnerability information submission and disposal, reporting of network security information, network security emergency support, and network security project, etc. for CNCERT and its sub-centers. As a National Network Security Emergency Service Support unit, Antiy has participated in the network security protection work of major political and social events, including the 17th, 18th, 19th CPC National Congress, sessions of the NPC and CPPCC since 2010, Beijing Olympic Games, World Expo 2010 (Shanghai), the 2010 Guangzhou Asian Games, APEC meeting in 2014, 70th anniversary of the victory parade of the Chinese People's War of Resistance against Japanese Aggression, G20 Hangzhou Summit, Belt and Road Forum for International Cooperation, the BRICS Summit and so on.